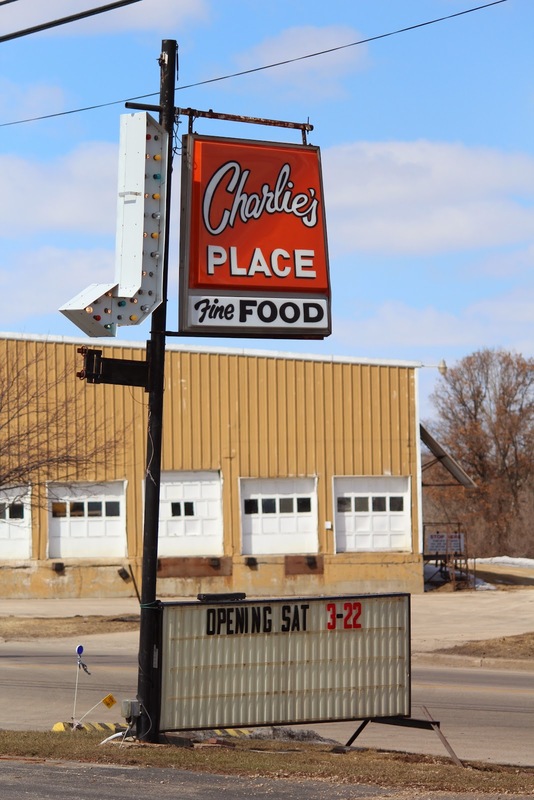 Charlie's Drive-In Restaurant is located on eastbound West Main Street / Wisconsin Highway 15, at its intersection with North Douglas Street, at 806 West Main Street, Hortonville, Wisconsin 54944. Just call me Mrs. J. Wellington Wimpy! I love my hamburgers. They've been my favorite food for as long as I can remember. From the meat, to "all the fixings", to the lightly grilled bun, Charlie's has some of the best burgers I've ever eaten! 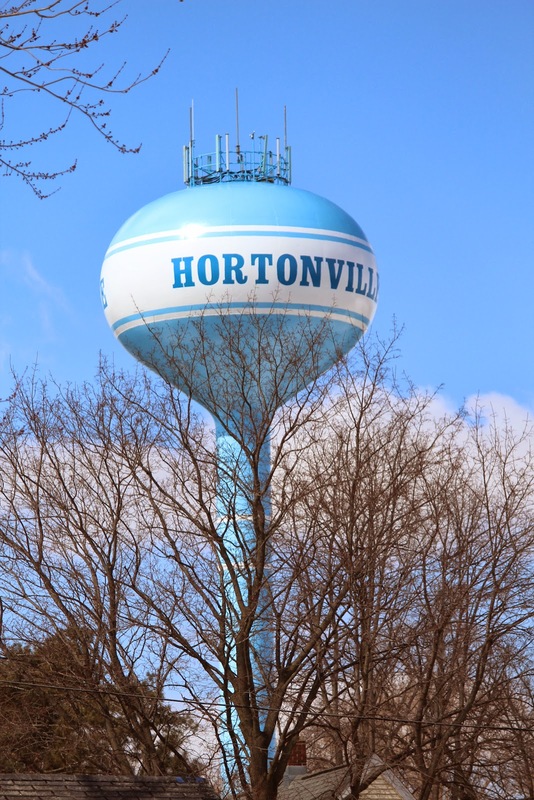 So, where the heck is Hortonville? Closer than you might think! It's an easy commute out Highway 15, just 10 miles west of Highway 41 (at exit 139). Charlie's is well worth the trip. Check 'em out! You'll get hooked, too! There's nothing in the world that can compare, with a hamburger juicy and rare . . .
UPDATE: Returned March 23, 2014 (1) to rephotograph the location, and (2) because I've been craving another burger and more onion rings since my first visit! Another enjoyable experience, another tasty meal (this time there's photos). My Miss Maxine passed away only a couple of months after we found Charlie's in August 2012. My new doggie, Dexter Noel, joined me on this trip. He opted for the grilled chicken (which was delivered already sliced! such service! ), and loved it! Charlie's is definitely one of my favorite places to get a burger! FIRST VISIT: August 4, 2012: Discovered this place en route from Marker 466 to Marker 282. It's a drive-in with carhops, burgers and fries / onion rings, root beer floats -- just about anything you can think of that reminds a person of the 1950's -- including music from the era playing on outdoor speakers. Everyone there was super nice! Even the owner came out to say hello. Maxine and I each had a burger, and I had onion rings and a root beer. It was yum, yum, yummy!!! Not great photos -- it was super overcast today. Will have to return for a reshoot! Bacon cheeseburger . . . Mushroom burger . . . Big burger! Oh, my! In the summer, this place is packed. which explains the empty tables! and perfectly fried onion rings. Mmmm mmmm mmmmmmmm! Dexter loved his grilled chicken. It disappeared in about two seconds! Just about time for this place to have it's own historical marker! 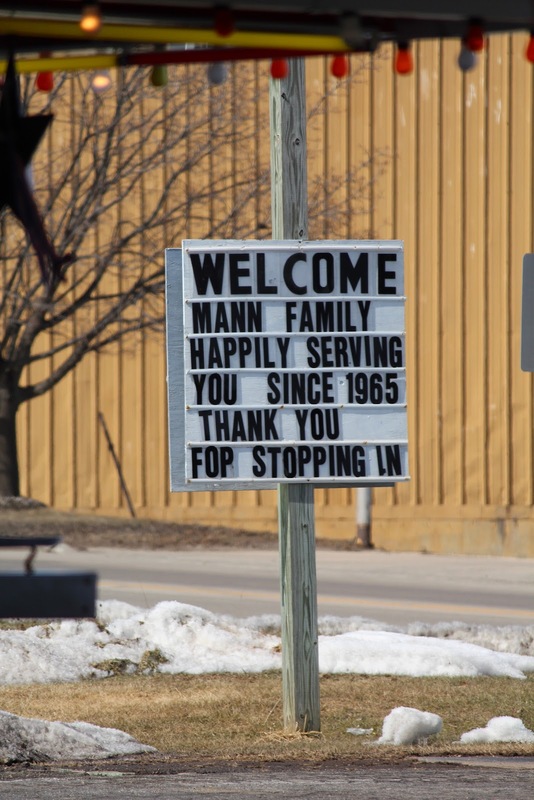 A small town with a fabulous drive-in restaurant! I love Charlie's, too!!! Amazing food and service! Love the BBQ's! We were there today, also, in the 27 degrees. We really enjoy the good ole carhop days here! I haven't tried the BBQ! Thanks for the comment and the suggestion! I love Charlie's and have been going there for years. Carl has the best fried mushrooms in the area. Make sure you get them with the horseradish sauce. Also, Carl has now open a bar/diner on Main St. in Hortonville, next to the library. Thank you, Joy, for stopping by and for recommending the mushrooms! They sound delicious, and I love horseradish sauce! Looks like a lot more trips to Hortonville -- both to Charlie's, and to check out the new diner on Main Street! Melinda, it's called The Darkroom Lounge, in Hortonville. You need to go to Charlie's in August when Carl and his wife dress as Elvis and Marilyn for his Elvis week. Like both places on FB and you'll get updates. Thanks for the info! I hadn't found the Facebook page -- I've liked it and added it to my post. Yes, hoping to make the Elvis week this year!